Reconstruction of small and medium-sized defects of the nose poses a challenge to the facial plastic surgeon. Flaps for small to medium-sized defects most often are closed in single-staged procedures as opposed to larger-sized defects. A variety of techniques can be used including secondary intention, primary closure, full-thickness skin grafts, composite grafts, rhomboid flaps, bilobe flaps, dorsal nasal flaps, island flaps, and inferiorly based meliolabial flaps. Reconstruction of small and medium-sized defects of the nose poses a challenge to the facial plastic surgeon. 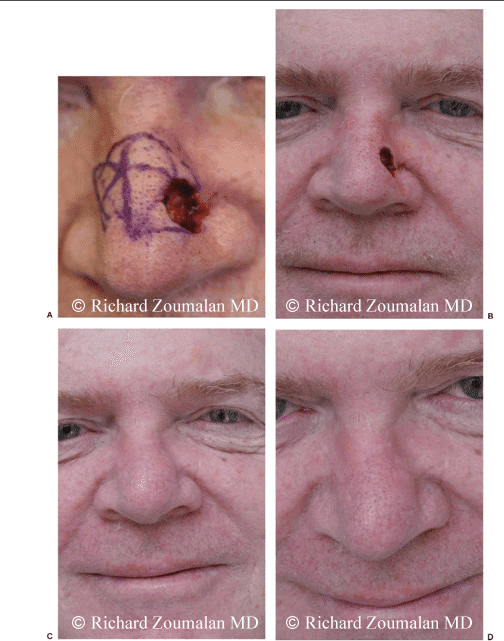 Every Mohs repair is inimitable based on the unique characteristics of the defect itself, diversity in skin types among patients and even within the nose itself, variability in structural support, comorbidities, and specific patient aesthetic goals. Mohs defects of the nose can be classified according to size. Defects less than 1 cm in diameter are considered small. Medium-sized defects are defined as being 1 to 1.5 cm, and those larger than 1.5 cm are considered large.1 Conceptually, medium-sized defects are those that can be closed with a single-stage local flap, whereas large defects typically may require multistage procedures with regional flaps. In small to medium-sized defects, the subunit principle also may hold less weight than in larger ones. In this article, we will describe important factors to consider in preoperative planning, as well as the main reconstructive options for small and medium-sized nasal defects. During the planning stage, the surgeon must consider the patient’s overall health. Serious comorbidities may preclude multistage operations. In such patients, aesthetic outcomes may be sacrificed for patient safety. However, age alone should not affect the surgeon’s decision. 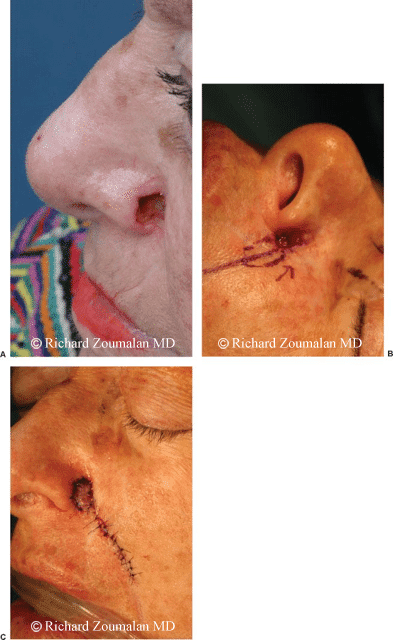 In a group of patients over 80 years old who underwent nasal reconstruction, Shumrick, Campbell, and Becker had good to excellent cosmetic results and no flap failure.2 Chronic malnutrition, bleeding diatheses, uncontrolled hypertension, smoking, and uncontrolled diabetes worsen healing and increase the potential for complications. Patients should be medically optimized as much as possible before the resection/reconstruction. 1New York University School of Medicine, Division of Facial Plastic Surgery, Department of Otolaryngology–Head and Neck Surgery, New York, New York. Address for correspondence and reprint requests: Anil R. Shah, M.D., Facial Plastic & Reconstructive Surgery, 7 West 51st Street, 6th Floor, New York, NY 10019. Aesthetic Reconstruction of Head and Neck Defects; Guest Editors, Manoj T. Abraham, M.D., F.A.C.S., Keith E. Blackwell, M.D. Facial Plast Surg 2008;24:105–119. Copyright # 2008 by Thieme Medical Publishers, Inc., 333 Seventh Avenue, New York, NY 10001, USA. Tel: +1(212) 584-4662. DOI 10.1055/s-2007-1021893. ISSN 0736-6825. Our preoperative planning, in concert with the Mohs surgeons, includes cessation of smoking 3 weeks prior to excision/reconstruction. If the patient has not quit by the time of excision, he or she is advised regarding potential vascular limitations and complications of their reconstruction. Preoperative assessment should consist of diligent examination of both the defect itself and the surrounding tissues. The location and depth of the defect, along with the destruction of normal skin structures, should be noted. Attention should also be paid to the potential vascularity of the floor of the defect. This is especially important in assessing the suitability of the bed for a potential skin graft. Classically there are nine nasal subunits with some texts describing the root as an additional subunit of the nose. The three zones of nasal skin types have widely divergent differences in skin thickness and mobility. The skin color, texture, and porosity of the nasal skin surrounding the nasal defect will play a critical role in ultimately determining the type of reconstruction that will appear most natural. Preoperative planning should also include analysis of previous scars and areas of radiation. A history of nasal tip cyanosis in response to cold temperatures may indicate vascular compromise. However, typically the blood supply to the nose is abundant, with branches from both the external carotid (facial and angular artery) and the internal carotid (ophthalmic artery). Cartilaginous support to the nasal tip and external and internal valves should be assessed preoperatively. Even minimally weak external or internal nasal valves are susceptible to further compromise after Mohs repair. Unfortunately, there is no simple solution to repair and diagnose potential nasal valve incompetence. Some potential solutions include placement of alar batten grafts and of lateral crural strut grafts to support the existing lower lateral cartilages, onlay grafts, alar rim grafts, spreader grafts, and upper lateral cartilage splay grafts. A working knowledge of aesthetic and functional rhinoplasty is required to determine which graft to place and how. Avoidance of alar displacement is another important assessment, as minimal vectors of wound tension can cause unwanted alar retraction.7 A surgeon must be able to accurately predict how these forces will affect the position of the ala.
Preoperative consultation plays an important role in managing the patient’s expectations of aesthetic outcome. Ideally, preoperative photography is performed prior to Mohs resection to allow for a better concept of the patient’s nose. Nasal and alar symmetry must be assessed, documented, and discussed with the patient to prevent any misunderstandings after surgery. As in any facial plastic surgery procedure, patient expectations should be tempered and a typical recovery course outlined. Patients must be counseled on the major risks of reconstructive failure including tissue necrosis, scar formation, infection, hematoma, and wound contraction, any of which may cause disfiguring asymmetry or adverse effects on nasal airflow. Reconstruction is offered when the defect is deemed unsuitable to heal by secondary intention. Reconstructive procedures help prevent complications of wound contracture. Additionally, for patients who are uncomfortable with open wounds on their face, reconstruction offers immediate coverage and decreases time of healing. In almost all our patients, reconstruction occurs immediately after Mohs surgery. However, in instances when immediate reconstruction is not an option, coverage of the defect is important to prevent desiccation of the wound. Increasing time to reconstruct may limit some reconstructive options at a future date, including the use of full-thickness skin grafts. Secondary intention is ideally utilized in wounds that are small, shallow, and on concave surfaces. In addition, wounds less than 1 cm in diameter, less than 4 to 5 mm in depth, and greater than 5 to 6 mm in distance from the mobile alar margin will often heal with excellent aesthetic results.7 In particular, the superficial areas of the alar groove, a concave area, can heal exceptionally well. If a defect of the alar groove is deep enough to extend to the subcutaneous fat and allowed to heal by secondary intention, it may result in a depressed scar, retraction of the alar rim, or nasal valve collapse.8 The lateral sidewall of the nose, especially near the medial canthus, also heals well with secondary intention. The tight, thin skin in this area with strong underlying bony support fights contraction well without distortion of the surrounding face during secondary intention healing. Wounds should be cleaned twice daily to remove fibrinous debris and covered with ointment to allow for a clean moist wound. Reepithelialization begins within 24 hours at a rate of 0.25 to 0.5 mm per day. Granulation tissue will begin to form within the first 72 hours. Both of these processes allow for wound contracture to start 5 days after creation the defect. Patients should be counseled that wounds take weeks to months to heal depending on the size of the defect, wound care applied, and individual physiological healing capabilities. Frequent weekly follow-up to ensure appropriate wound healing is prudent. Some patients benefit from external or internal bolsters to prevent irregularities in wound contracture. An internal nasal splint is effective in defects of the alar region when concern over alar retraction and irregular wound healing may occur (Fig. 3). An external bolster is applied to the dorsal sidewall or medial canthus to help reduce the incidence of webbing. Dermabrasion may be used after 4 weeks if minor contour irregularities exist (Fig. 4A,B). However, large distortions may require excision and replacement of the contracted tissue and may be much more difficult to reconstruct than the initial defect. This patient had a small, shallow nasal defect. However, the lesion was located 4 mm from the alar margin and on the convex aspect of the ala. Despite this, the patient healed without alar retraction 4 weeks after her Mohs procedure due to strong lower lateral cartilages and alar splinting. She will require a dermabrasion procedure to improve contour irregularities. 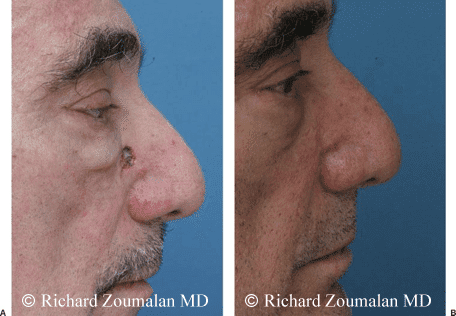 In the upper half of the nose, primary closure is possible with small defects. In this area, the skin is usually thin and compliant. In contrast, the skin of the nasal tip of the nose cannot be readily closed primarily due to a lack of laxity. Defects of the caudal and middle third of the dorsum will rotate the tip cephallically if repaired in a transverse fashion. This may be aesthetically desirable in some patients with senile tip ptosis. A vertical closure will limit nasal tip rotation. Glabellar defects should be closed horizontally to match the rhytids produced by the procerus muscle contraction. Certain defects may be amenable to vertical oblique closure, matching the action of the corrugators. 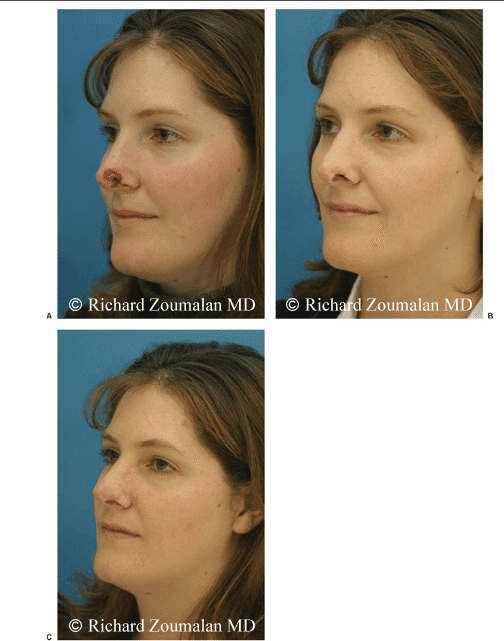 If not enough skin is available and the patient has a wide and/or large dorsum, reduction rhinoplasty can be performed.11 Dorsal reduction can be performed either through the wound or via a traditional rhinoplasty approach. Although a split-thickness skin graft is an option, it is rarely a good one. Split-thickness skin grafts avidly contract and undergo thinning and hypopigmentation, resulting in unsightly cosmetic appearances. Although they allow for coverage of a large area, their use is mostly limited to biological dressings. They can play a role in the patient who has a virulent neoplasm and will likely require further resection before a definitive reconstruction. The success of the graft’s ‘‘take’’ depends on several factors. Vascularity of the defect is crucial and dependent on underlying viable muscle, fascia, perichondrium, or periosteum. The graft also should be sutured to the underlying tissue using absorbable sutures so that a hint of concavity exists.16 A balance of meticulous hemostasis and prevention of cautery damage to the underlying vascularity of the wound bed must be exercised. Marginal quilting sutures will help collapse potential dead space, and central quilting sutures avoid lateral motion. A stent dressing allows pressure between graft and bed to improve vascularization to the graft. Full-thickness skin grafts on the nasal tip are a tempting choice, but several reconstructive principles should be kept in mind. 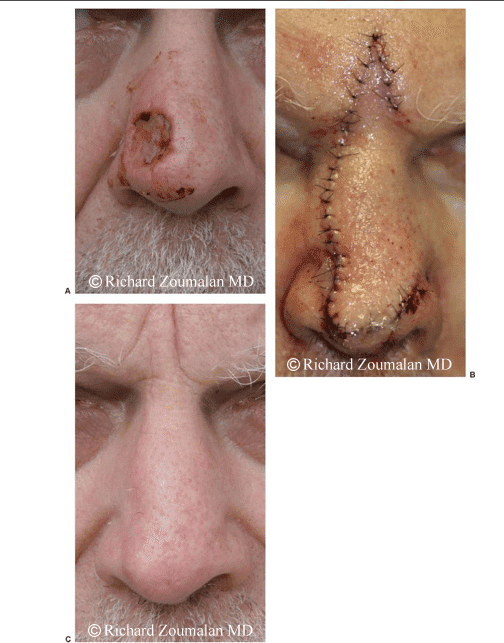 Nasal subunit technique should be used to prevent a patch effect. Less thinning is needed on full-thickness skin grafts than when used in the upper one third of the nose. Composite grafts contain two or more tissue layers. Due to the metabolic demand of the large bulk of tissue, they heal with great difficulty and are limited to defects less than 1 cm in size.15 This type of graft requires a nonsmoking patient without systemic illnesses or prior irradiation that would compromise revascularization. Composite grafts have been used for small (< 1 cm) full-thickness defects of the columella, alar margin, and soft tissue triangle (Fig. 5). The auricular concha is an excellent source for a composite graft. It is well suited for defects in the columella and alar cartilages. Other donor sites include the helix, antihelix, tragus, and antitragus. All these areas contain tight, thin skin overlying cartilage without much subcutaneous fat, making them good donor sites. Harvesting auricular grafts requires maintenance of the tight, thin skin to the overlying cartilage. The authors advocate injecting local anesthetic agents peripheral to the harvest site to maintain tight adherence of skin and cartilage. In addition, one or two central sutures may help prevent disruption of the cartilage and skin. Finally, trimming the underlying cartilage to allow for a slight excess of skin to cartilage can lead to increased uptake of composite grafts. 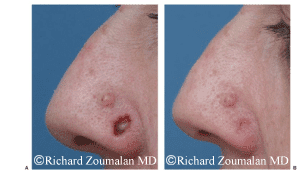 Figure 6 (A, B) Patient with lateral nasal wall defect bordering cheek subunit. A rhomboid flap was designed and hidden within the nasolabial fold to close this defect. Limberg originally designed the rhomboid flap. In his design, the location of maximal tension is at the closure point of the donor flap defect.23Dufourmentel added a modification that rotates the axis of the donor site by 30 degrees.24 Webster et al added a further modification of the flap, which he calls the ‘‘30-degree transposition flap.’’25 In all versions of the rhomboid flap, as long as the flap and the tissue surrounding the flap are adequately undermined, there should be little to no tension on the flap. The Dufourmentel flap makes the closure of the donor site much easier and decreases tension there. However, this is at the expense of increased tension around the transposed flap’s borders. If possible, the line of closure of the donor site, which is usually the area of maximal tension, must be placed in a line of maximal extensibility of the face. It also must be placed in an area that will produce the least distortion on the face. Areas that have high risk of distortion are the nasal alae, medial canthus, and oral commissure. to restore the defect. The secondary lobe is used to repair the donor site of the primary lobe. The donor site of the secondary lobe is closed primarily. 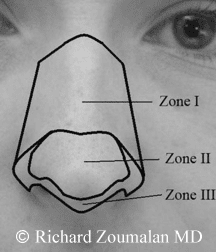 Flaps based laterally on the sidewall of the nose are best for defects near the nasal tip, and medially based flaps are better for repair of lateral alar defects.27 Flaps based laterally may be limited by tension at the medial canthus and may need to be medially based to facilitate closure (Fig. 7A–E). Figure 7 (A–C) A medium-sized defect involving the left supra-alar crease and left nasal sidewall. A medially based flap was chosen for this case because a laterally based flap would have limited rotation secondary to pivotal restraint at the medial canthus. Limitation of nostril movement is essential in the planning of bilobe flaps. The flap’s design is highly flexible. Esser, in his initial description, stated that the angle of tissue transfer had to be 90 degrees.28 However, subsequent authors have found that the angle can be decreased significantly to suit the situation.29 Perhaps the most significant modification was by Zitelli27, who adjusted the rotational angle to 50 degrees each, decreasing the buckling around the pivot point and the distal distortion from previous bilobed flap designs. To ensure a safe blood supply, the width of the second flap should approach the width of the first flap. Undersizing the primary or secondary lobe may result in increased tension, scarring, and distortion. Oversizing may lead to trapdoor deformity and uneven contours. In cases of thick donor site skin, the primary lobe should be the same size as the defect due to limited ability to stretch the primary lobe. the unsupported alar rim inferiorly. This is especially true at distal flaps near the alar rim. However, over-zealously thinning the flap may compromise blood flow to its distal part. To prevent this, the surgeon may choose to instead deepen the defect when possible. When designing the bilobe flap, the location of the dog-ear can also effect alar displacement. Placement of the dog-ear within the supra-alar crease is preferred rather than in the convexity of the nasal ala.21 Dog-ear designs further from the alar rim may lead to less alar displacement as well. Dog-ears within the supra-alar crease also lead to less visible scars. The secondary lobe may play a larger role in alar displacement than previously thought in laterally based bilobe flaps.33 The secondary lobe may exert wound vector forces, which may influence alar displacement, which was recently suggested by a fresh cadaveric study. Vector alignment of the secondary lobe perpendicular to the alar margin decreased the amount of alar displacement, and alignment of the secondary lobe 45 degrees to the nostril margin created alar retraction (Figs. 8A,B and 9A, B). nose reconstruction prepping Figure 8 (A, B) In a laterally based bilobed flap, the secondary lobe should be designed perpendicular to the nostril to account for wound contracture. 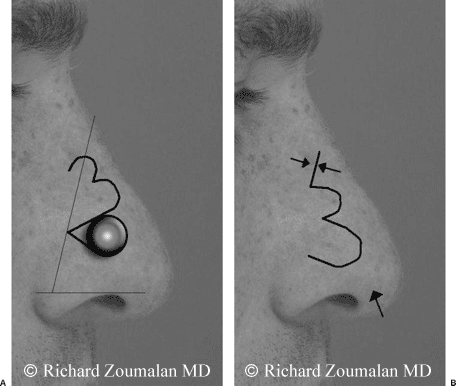 Figure 9 (A, B) In a laterally based bilobed flap, if the secondary lobe is designed with an acute angle in relation to the plane of the nostril, alar retraction may occur postoperatively. The dorsal nasal flap can be used for medium-sized defects of the nose. This flap was originally described by Rieger35 and has been subsequently modified.34 Due to its large size, the glabellar flap has the potential risks of distortion and flap necrosis. The flap recruits skin from the more mobile glabella and transfers it caudally to the less mobile tip by incorporating a V to Y advancement cephalically. 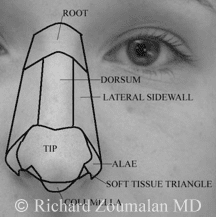 Thus, a long incision is created from the glabella to the nasal tip with undermining as far wide as midcheek (Fig. 10A–C). 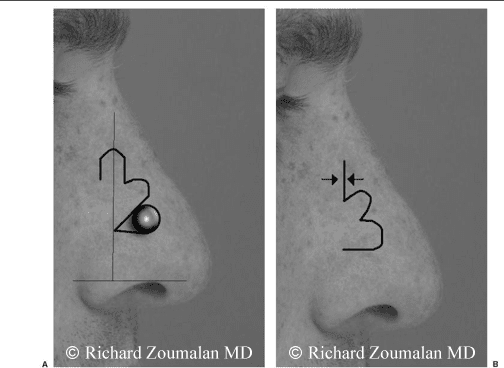 Figure 10 (A–C) A medium-sized defect that was deemed too large for a bilobed flap based on the location of the defect and the anticipated changes in nostril symmetry. A Rieger flap was designed within the nasal tip subunit and along the dorsal subunit to improve shadowing of scars postoperatively. Once the flap has been elevated, broad under-mining occurs laterally. Deep sutures to stabilize the flap to the underlying periosteum will help minimize unwanted vector pulls. Buried vertical mattress sutures can also help anchor the flap.34,35 In the dorsum and supratip regions, this flap causes less local distortion than the bilobed flap. Due to risk of alar retraction, it should be used cautiously in unilateral alar rim or dome defects. With a single stage, an inferiorly based melolabial flap can provide an excellent option for full-thickness, medium to large alar defects. It is most ideal for defects in the lateral alae or in the lateral alar groove.36 Also referred to as the nasolabial flap, it consists of cheek tissue surrounding the melolabial crease from the ala to the oral commissure. The technique involves a long incision in the melolabial fold. Pivotal restraint shortens the rotated flap, and this must be taken into account when designing the length of the flap. However, oversizing the flap can lead to trapdoor deformity. The flap is widely undermined in the central cheek to allow for rotation and transposition. Deep tacking sutures in the nasofacial sulcus are used to create adequate concavity. Dog-ear deformities are excised at the area superior to the surgical defect and the melolabial groove. Buried sutures are used to anchor the flap, and incisions are closed with running sutures. Revision procedures can be performed in the future to contour the alar groove. For columella reconstruction, unilateral or paired nasolabial flaps can be used for reconstruction. Total columellar reconstruction is well performed with pair flaps anchored to a cartilage columella strut graft. The columella strut must be sturdier than conchal cartilage. Septal and costal cartilage grafts are ideal. The island pedicle flap is also known as the V-Y flap. It uses an underlying subcutaneous pedicle to advance soft tissue into a defect while maintaining a healthy blood supply from its former location. The pedicle also includes venous and lymphatic drainage over most of its length.38 In the nasal region, it should be considered a musculocutaneous flap. It is a good flap for reconstruction of small to medium defects of the alar crease (Fig. 11A–D). Figure 11 (A–C) Patient with a defect at the alar crease. An island flap was designed in part due to patient desire to avoid a pedicled flap. Following the reconstructive procedure, a generous amount of antibacterial ointment is placed on the suture line. Postoperative oral antibiotics are given to patients with cartilage grafts, diabetics, immuno-compromised patients, and smokers. A nonadhesive dressing is placed over the area and secured using paper tape for the first 24 hours. Using cotton tip applicators soaked with saline, patients are taught to gently clean the wound and to reapply ointment three times a day. Sutures are removed on postoperative day 7. They are instructed to keep out of the sun, use sunscreen with a sun protection factor of at least 30 for the following year, and wear a protective hat whenever possible. The reconstructive options for small and medium-sized nasal defects are many. Within each reconstructive option, there are multiple planning decisions that must be made. Success in reconstruction lies in preoperative planning and a strategy that will predict the dynamic nature of soft tissue and its effects on underlying architecture.